Synthetic peptide within Human Glucose Transporter GLUT3 aa 450 to the C-terminus (C terminal). The exact sequence is proprietary. IHC-P: Human placenta tissue. 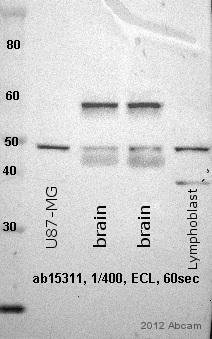 WB: U87 -MG cell lysate; Human brain lysate. Our Abpromise guarantee covers the use of ab15311 in the following tested applications. WB Use a concentration of 0.5 µg/ml. Predicted molecular weight: 60 kDa. Highly expressed in brain. Expressed in many tissues. Western blot - Anti-Glucose Transporter GLUT3 antibody (ab15311)Image courtesy of Georg Ziegler by Abreview. Formalin-fixed, paraffin-embedded human placenta tissue stained for Glucose Transporter GLUT3 using ab15311 at 1/50 dilution in immunohistochemical analysis. ab15311 staining Glucose Transporter GLUT3 in human placenta by Immunohistochemistry (FFPE-sections). 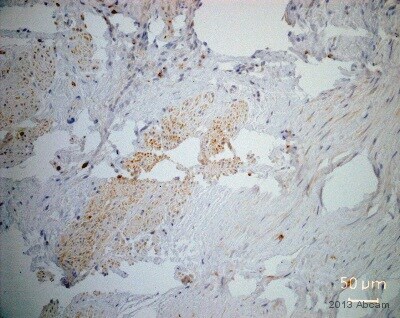 Immunohistochemistry (Formalin/PFA-fixed paraffin-embedded sections) - Anti-Glucose Transporter GLUT3 antibody (ab15311)This image is courtesy of an anonymous Abreview. Formaldehyde-fixed, paraffin-embedded human testis tissue stained for Glucose Transporter GLUT3 using ab15311 at 1/200 dilution in immunohistochemical analysis. Publishing research using ab15311? Please let us know so that we can cite the reference in this datasheet. I can see no apparent reason why this product would be giving you this pattern with your rat cortex samples independent of age or treatment. It is especially strange to me that it is working correctly in hippocampal tissues from the same animals. Have you directly compared these hippocampal samples to the cortical samples? I look forward to your reply. Please let me know if you have any further questions. 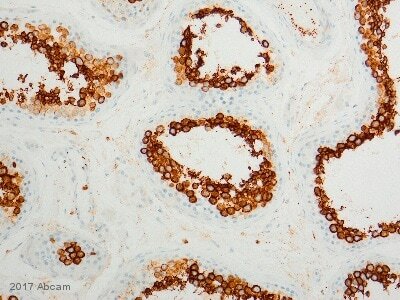 Hi I have a question about GLUT-3 ab15311 antibody (lot 789020). 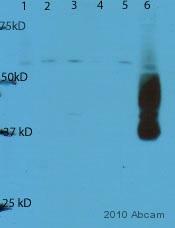 In a western blot for 50 ug rat cortex, we see the expected band at 45-48 kDa but we also see a strong band at 38-40 kDa. Some rats have only this band, other have the 45 kDa and other have both (independant of the age or treatment of our rats). I saw in one of the abreviews that this band had been seen before but considered non specific. But in our case, it's so intense and clean, we don't know what to think of it. We don't think glycosylation or phosphorylation will cause the band to be smaller (but we never know), as this been tested ? Thank you for your help. Your issue is very interesting as some animals because of the variablity between samples independent of age or treatment. Would you be able to provide your WB protocols and sample treatments? It may be an issue with the gel as the pattern looks similar to the image posted on our site but with lower weights, have you seen this response on multiple gels or just this once? Ichh habe eine Frage bezüglich ab15311. Ich bekomme mit diesem GLUT3-Antikörper in all meinen humanen Lysaten eine klare Bande bei ca. 48 kDa und bin ziemlich sicher, dass diese Bande spezifisch ist für GLUT3, da auch in vielen anderen Publikationen GLUT3 in diesem Bereich gefunden wird und ich auch mit ab53095 und ab41525 die gleiche Bande bekomme. Meine diesbezüglichen Ergebnisse habe ich bereits als Abbreview auf Ihrer Seite veröffentlicht. Zusätzlich detektiert ab15311 jedoch eine teilweise noch stärkere Bande bei ca. 38 kDa. Diese Bande taucht nicht auf in humanen Hirnlysaten, humanen Spermatozoenlysaten und humanen Lymphozytenlysaten, allerdings in sämtlichen Lysaten, die aus kultivierten Zellen gewonnen wurden (EBV-LCLs, U87-MG, SHSY-5Y, Fibroblasten), in denen die GLUT3-Expression eher niedriger zu sein scheint. Nun meine Frage: ist es möglich, dass das Immunogen von ab15311 an ein Carrierprotein gekoppelt ist und daraus die Bande bei 38 kDa resultiert? Bei ab53095 bekomme ich interessanterweise neben der vermutlich spezifischen 48 kDa Bande eine zusätzliche Bande bei 29 kDa, was mich darin bestätigt, dass diese Banden unspezifisch sind. Es wäre von Vorteil, wenn Sie ein Blocking-Peptid für ab15311 zur Verfügung stellen könnten. Vielen Dank für Ihre Anfrage und für Ihre Geduld. Click here (or use the following: https://www.abcam.com/index.html?datasheet=105625). Als Carrier- Protein wurde KHL (Keyhole limpet hemocyanin) verwendet, welches laut BLAST keine Übereinstimmung mit der Immunogen- Sequenz aufweist. Wir sind daher genauso ratlos wie Sie bezüglich der Nebenbanden. We received 4 vials of antibody today that are all at room temperature. I am concerned that these antibodies will not work as expected and I don't want to waste time/effort/reagents with these suspect antibodies. I would like replacements of each as soon as possible. I am sorry this product did not perform as stated on the datasheet and for the inconvenience this has caused. As requested, I have issued free of charge replacements. Bitte teilen Sie uns die IgG Konzentrationen nachfolgender Antikörper Lots mit. Vielen Dank für Ihre Anfrage. Es freut mich bestätigen zu können, dass beide Antikörper keine Lot-spezifische Konzentration aufweisen. ab14994 hat eine Konzentration von 1mg/ml und ab15311 hat eine Konzentration von 0.2mg/ml. Bitte folgen Sie diesen links um zum jeweiligen datenblatt zugelangen und für mehr Informationen zu diesen Antikörpern: Click here (or use the following: https://www.abcam.com/index.html?datasheet=14994). Click here (or use the following: https://www.abcam.com/index.html?datasheet=15311). Ich hoffe diese Information war hilfreich und wünsche Ihnen viel Erfolg mit Ihrer Forschung. What is the homology between the immunogen of this antibody and the chicken sequence? The accession number of the chicken sequence is NP_990842. Thank you for your enquiry. I was able to obtain the immunogen sequence. This has been updated on the datasheet: SIEPAKETTTNV aa 485-496 of human Unfortunately, it appears there is no significant homology between the chicken sequence and the immunogen. I am sorry I could not be more helpful.